In relationships, we often build walls between us and the ones we love. Those walls are made from single bricks, each brick related to a hurtful moment, a time when my spouse/friend/partner turned away from me. The walls can grow so big that you cannot look past it or get around it. The wall is built and you think the relationship is over! While the wall is built gradually, the only way to get rid of the wall is to blow it up! Yes there will be a mess, there will be bricks and mortar that need to be picked up one at a time, but the explosion is instant. We are now in Elul, a month of introspection. In Elul, we reach out to G-d to bring down the wall we have built throughout the past year. We’ve exhibited signs of ignorance, carelessness, at times we’ve neglected the relationship, approached Judaism with the wrong attitude, and our ego has helped us with self-justification every time we messed up. So now, in the month of Elul, we tell G-d that we will blow up this wall that we built; today, I am a new man! Today I begin to pick up the pieces and rebuild my relationship with you! The Zohar says: The body of man is a wick, and the light (soul) is kindled above it......"The light on a man's head must have oil, that is, good deeds". So I will increase in the good deeds that I do to ensure there are light and heat in our joint home without a wall ;). Like many of you, my facebook feed was filled with people who shared that Billy Joel wore a yellow star at a recent concert, the kind worn by Jews during the Holocaust. He did this in solidarity with Jews, and against hate. To be clear, I think the sentiment, that he stands with fellow Jews (it appears his parents are Jewish, making him Jewish) and against hate, and standing up in such a bold manner is incredibly powerful and brave. He is to be lauded to for standing against hate, in a hostile world that has anti-Semitism simmering just below the surface. Having said that, I think he missed a really great teaching moment. Let me explain. His point, was obviously to make a bold statement, that I am against hate, and I am supportive of Jews. However, as we’ve heard in politics so many times, you need to be the party that is for something, not the party that against things. The Holocaust, is a critical part of our past, and a part of history, that is etched into our souls, that has spawned that "NEVER AGAIN" is the mantra that we live and repeat always. However, the core of our religion cannot be only that of "never again." You know why? Because, sadly, just 70 years after the horrific destruction wrought by the Holocaust, people, particularly, children, teenagers, yes, millennials too, have forgotten or don’t want to hear about it anymore. If they do, it is just the basics, they don’t want to hear all the gory details of what happened that lead to NEVER AGAIN. At our Hebrew School, one parent chided me for frightening the children when I tried to very delicately discuss the generalities of what happened and why it is important to remember. If our whole identity is wrapped in the that horror of the past, then we are guaranteed that it will not be NEVER AGAIN FOREVER. Try this on for size, imagine Billy Joel had put in a Kippa instead? (Pun intended). Rather than telling the world what happened, he’d be explaining what we are for, and why NEVER AGAIN, should indeed never happen again. Not just because such despicable and wanton murder and plunder ought not be allowed to happen again, but more importantly, because, we the Jews stand for something. It is not, Gd forbid that the yellow star did not make a good and salient point. Of course it did. It is just that the Yamukah would have made a much better and stronger point. It would have said what we are for, rather than what we are against. This concept exists in every arena of life. Politics, family and business, and even Jewish life. We are not only Jews for the things that are the tragedies of life (what I will call the things we are against). Including when Holocausts (personal or public) Gd forbid arrive, or when there is marching in Charlottesville, or when someone passes away, or a serious holiday arrives (think Rosh Hashanah and Yom Kippur that are upcoming). We are Jews even when things are quiet, and no one is chasing us, and it is an ordinary Tuesday in middle of February. We are Jews then too. We tend to show up on the scary days-think Yom Kippur, but skip out on the fun ones! We are Jews on Simchas Torah and Purim too. So, Mr. Billy Joel, you are to be commended for standing up in the face of bigotry and hate. For that I an many others, including Gd I believe, bless you. However, to those of us hearing the message, see him in a bright yellow Kipah and not only the star, and then we will have really heard the message he was sending. There is s story told of a prominent Jewish leader who suggested that the Rebbe tell all his Chabad followers to add an extra chair, that would remain empty, at the Passover Seder to commemorate those missing because of the Holocaust. The Rebbe wisely replied, that he would encourage an extra chair at every Seder, but to be certain to fill it with another person who'd otherwise not have been at the seder. Doing something commemorates those who perished, not an empty chair. The point; Judaism must be about what we are for, not what we are against, that will ensure its continuity. Good Shabbos, and Happy Chodesh Elul! Ethan Ertel you are one amazing kid... You are proud of who you are and what you stand for. 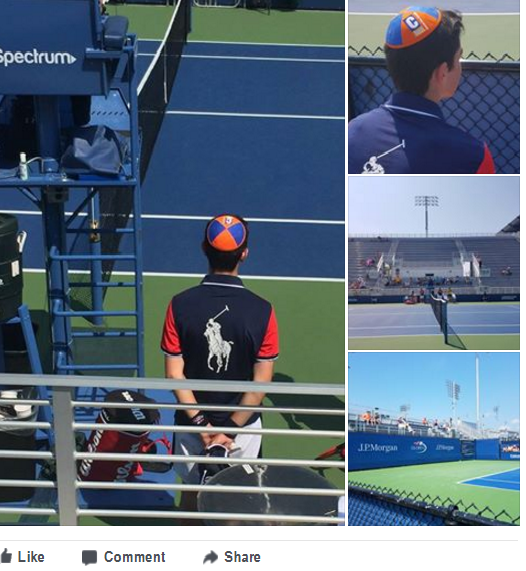 As I was sitting at the US Open and watching you ball boy with your Kipah on your head I thought to myself there are so many adults who can learn from you of what it means to be a proud Jew. Thank you for teaching me. Jacques Ertel"
G-d willing tonight I will sleep in my own bed for the first time this week. 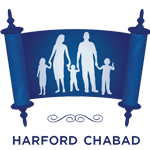 Thank G-d it was a busy week; learning, teaching, helping other Rabbis and a CEO to enhance their synagogues and businesses respectively, and their lives as a whole. My travels took me on 3 flights to 3 states. I noticed that on all three flights (note: these trips were alone without my wife and our children) the noisiest part of the flight was from takeoff until we broke through the clouds. There is a known teaching of the Baal Shem Tov: "Every single thing that a person sees or hears is an instruction to him in his conduct in the service of G‑d". Which got me thinking; what can I learn from this extra noise and why specifically at that part of the flight process? Just like an airplane needs to combat the natural forces that would cause it to fall or remain on the ground in order to fly, so too we need to combat our natural force, our "ego" or "self", that does not allow us to soar spiritually. These forces can take on many forms like preconceived notions, self-talk, e.g. "I can never go kosher", "there is no way I can keep Shabbos", etc. or others. When we start to fly and are struggling against those forces, there is a lot of noise. Sometimes, it is an external noise: "you eat kosher?!" or "I didn't know that you became more observant". Other times, it is an internal noise: "c'mon, just taste it" or "what will my friends say?" etc. It is true, for the first “10,000 feet” it is hard, it is noisy, you cannot use approved electronic devices, your seat belt must remain fastened etc. Then, the noise slowly fades and you keep climbing. 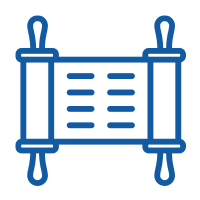 You can now use electronic devices (excluding Shabbos). Having reached cruising altitude, you can get out of your seat and move around. Nonetheless, do not become complacent at your new level, if you are not vigilant, you may hit turbulence or other complications and you will need to refasten your seatbelts just to stay safe. Ignore the noise, make sure you did the correct safety checks and get ready to fly, get ready to get high in honor of the High Holidays. Fraida and I have been doing a bit of traveling with the kids over the summer. Travel is fun and exciting. For one child, the packing of her very own suitcase is thrilling, for another, it’s playing with cousins and for the third, visiting the beach is the highlight. Just visiting the west coast is an experience; add grandparents, aunts, uncles and some cousins and you just multiplied the enjoyment. One of the challenges of traveling with a family is the baggage. The strollers, suitcases, food, etc. can be a lot to maneuver. And the two (if both are present) adults only have a limited amount of hands. In short, it can be a daunting task. When you arrive at the airport, you can pay a few dollars to rent a baggage cart that can hold your bags. Problem solved? Not entirely! The baggage cart can only hold so much. 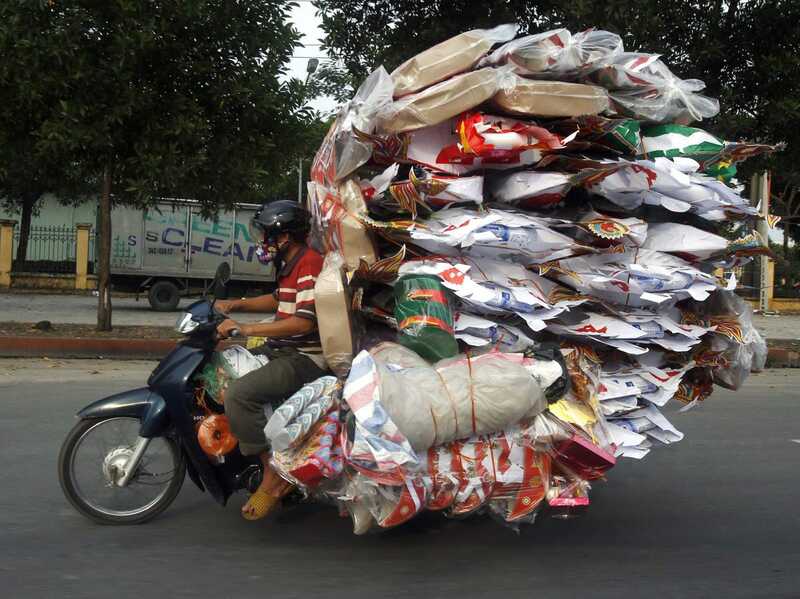 If you put too much baggage on the cart, the luggage will fall. In life, we all carry baggage; hurts, pains, old fights, resentment of things that happened many years ago, etc. Over these trips, I have gained a new perspective regarding baggage. You can have baggage but you are limited in space. You can only carry a certain amount. If you want to carry some of your loved ones’ baggage, you can! If the load gets too heavy, you can get a luggage cart to help you manage it. Other people’s baggage? Please leave it on the baggage carousel; let them carry their own. With High Holidays around the corner, it is prime time to think of some of the extra baggage you can remove from your life. Are you holding onto resentment that is causing harm to your relationships? Is something that you are carrying causing you to feel disconnected? Do you feel that the past is weighing heavily on your shoulders? Think of something you can do to relieve yourself of that burden. It is not baggage you should be carrying! Currently, I am reading (Thank you Marianne for the suggestion) "The Confidence Game" by Maria Konnikova which explores the mind of the con man. At the end of the book, she shares her knowledge to help people stay ahead of scams and potential pitfalls. She writes "The final mode of attack - one that is, in many ways, fundamental, is knowledge, pure and simple." This brings me to a thought on this week's Torah portion. Children question their parents about their beliefs, lifestyles and choices. Many times we do not have an answer to our children's questions and we tell them "I don't know". However, when we are prepared for the question and have time to formulate a good answer, that is ideal. Some common questions: How do I know Judaism is true? What are all these rules and laws that Judaism imposes on us? Is it worth it? Have an answer ready! "Because our ancestors, with a traceable chain, passed down the traditions from when G-d took us out of Egypt, gave us the Torah and brought us to Eretz Yisroel." "We were chosen by G-d to have a relationship with Him that includes limiting our relationship with others. We need to make sacrifices to keep that relationship alive! While, it is not necessarily easy, it is absolutely worth it! The relationship is deep, meaningful, good for us and keeps us alive and vibrant." How did you comprehend them?